Samba Gadjigo is a Senegalese man who credits Sembène’s early writings with helping a teenage Gadjigo find pride in self-identifying as an African; before that, no one had found a way to accurately reflect the African experience in a culturally relevant way. 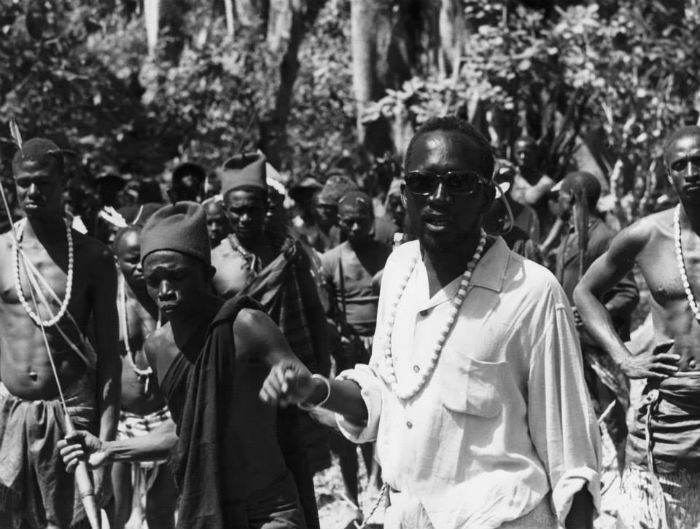 Once he joined the faculty at Mount Holyoke College in western Massachusetts, Gadjigo sought out his idol, bringing Sembène to speak initially on campus, and later, around the United States for the first time. The pair toured with rare prints of Sembène’s early films, enlightening and engaging audiences wherever they appeared. Prior to Sembène’s death in 2007, Gadjigo promised his mentor he would not let his iconic work—or expectation-defying life story (Sembène was an autodidact who transformed from under-educated dockworker into a cultural master)—be lost to obscurity. To that end, Gadjigo teamed up with Jason Silverman, a film festival/arthouse director (and film producer) for a project that would consume both men for the next seven years. Because the financing was a constant struggle (another Sundance refrain), the film went through several iterations before the filmmakers teamed up with Cuban editor Ricardo Acosta, creating the poignant and stirring version of Sembène! that premiered in Park City last week. The film entranced audiences who were a mixture of Sembène aficionados and unschooled-but-open cineastes, eager to learn more. Sembene! is a crucial piece of cinematic history, (finally) introducing a global audience to a groundbreaking filmmaker who deserves to be much more widely recognized for his audacious and legendary storytelling than he is today. With any luck, this film will set things right. Before they left Park City, Gadjigo and Silverman sat down with us to discuss Sembene’s radical determination to create a cultural “mirror for Africans,” his significant legacy, which reverberates around the world, and their favorite screening in Utah.